Dive into your incredible beach vacation at Ocean Pier II, a resort located in the picturesque Windy Hill area of North Myrtle Beach, South Carolina! This charming three-story rental condominium complex is studded by palmettos and lush landscaping. Set just across the street from the beach, it is the perfect oasis to land your North Myrtle Beach getaway. This resort exudes a beachy ambiance, from the fresh crisp exterior to the bright condos within. Nicely and comfortably furnished, the rental condos serve as a home away from home while still feeling pleasingly miles away. Allow the worries and stresses of everyday life to melt away into oblivion as you step into the relaxing pace of North Myrtle Beach, South Carolina, where your days will be as unhurried as you desire them to be. Dripping with amenities, Ocean Pier II vacation condos are equipped with full kitchens and bonus balconies, where you will enjoy a pleasant view of life just steps away from the white sandy beaches and the Atlantic Ocean. With nary a care in the world, invest your vacation days lounging around the sparkling blue resort swimming pool, or grab your beach bag on a jaunt across the street, where you will enjoy access both to an oceanfront pool and to the ocean itself. Wiggle your toes in the warm sand and take a dip into the restoring ocean surf. 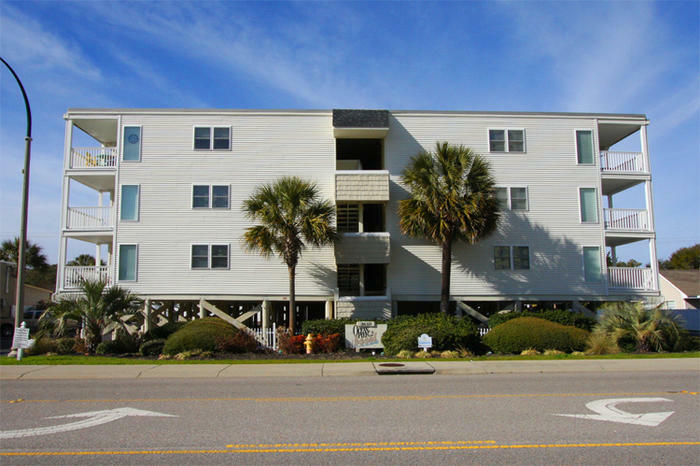 Your rental resort condo at Ocean Pier II hands you a ticket not only to the beach, but also close proximity to mounds of activities in North Myrtle Beach, South Carolina. The area is overflowing with shopping, restaurants, attractions, golfing, water sports, and the arts. Fulfill a pressing adrenaline rush by jet skiing, parasailing, even skydiving! Grab the opportunity to get in some pier fishing or signing up for a chartered deep-sea fishing expedition. If golfing is in your radar, you will have a choice from over 100 courses of various difficulties, including some highly recommended by Golf Magazine. Be prepared to indulge your sense of culinary adventure with over 1,000 restaurants and eateries in the North Myrtle Beach area. With everything from casual to fine dining, from good old-fashioned hamburgers to elaborately prepared seafood dinners, there is something to please every palate in your group. The Ocean Pier II resort is also nearby the popular Barefoot Landing, an amazing destination for shopping, dining, entertainment, and nightlife. Here, you are never bored unless you want to be! Elliott Beach Rentals is not affiliated with onsite management or the HOA of Ocean Pier Ii.